I'm officially on countdown (not that I haven't been for the last 5 weeks too, but hey...) until the kids all go back to school. Just over one week to go!!! Nicholas was at Deanes on Monday doing Rounders & Dodgeball. Once all kids had been picked up, we headed over to the in-laws as it was Barbara's birthday, for tea and cake - yum! Tuesday saw us meeting up with Lyn and her two sproglets Zach and Paige - were supposed to be venturing over to the woods, but the wet weather put paid to those plans, so it was a play date at our house instead. On Wednesday i got to spend the day with my youngest son and I'd promised him breakfast out, so we found a lovely little cafe in Leigh called "Hippo's" and we've made it ours. Although may just have to find another one as I wasn't that impressed with it. Toast and a bacon sandwich later, we were full and ready for the cram packed day Nicholas had planned for us both. I really enjoyed spending some quality 1:1 time with him, even if he did end up playing on the PC for a bit in the afternoon whilst I sorted out my Avon! Thursday was kind of a chores day/mess about day and on Friday we met up with Michelle to go over to Wat Tyler on our bikes. However, despite it being the middle of summer, the constant rain made that idea not viable, so we tossed a coin and ended up over at Partyman in Basildon. 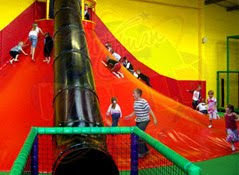 £30 later to get 4 kids and 2 adults in for 2 hours of play - we wont be going again! Still, Mich and I got to have a good catch up! Saturday was THE day I'd been looking forward to all holidays. Mum had kindly agreed to have Cassie for the day as I'd booked for Lee and I and the boys to go and see "Batman Live" at the 02 Arena and we weren't disappointed. It was absolutely FANTASTIC!!!! I dont' know who enjoyed it more, Lee and I or the boys?!!! We had fabby seats (and so we should of for the amount of money they cost) but it was a show like I've never seen before and I've been to a few! 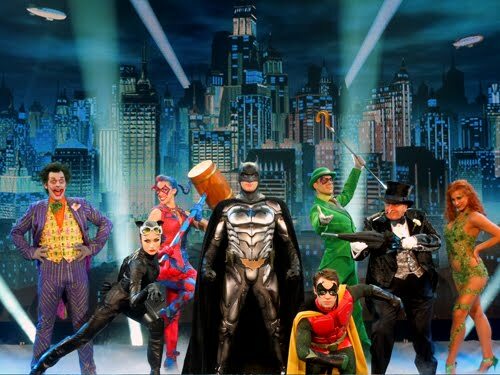 The "bad guys" were just great - The Joker, Riddler, Penguin, Harliquinn, Two Face, Catwoman, Poison Ivy and Scarecrow , but the best bit had to of been when the batmobile came on stage and Batman drove off in it!! Lee and I were jumping around and yelling and the boys were just looking at us like silly people. Pure classic comic book stuff was at the end when Batman and Robin ran off with their capes flying behind them... just brilliant. Sunday was a bit of a wash out day as Alex was rather poorly - so it turned into a "jobs" day - cleaning out the guinea pigs, tidying out the shed, homework etc etc. I also had to sort out some stuff and load the car as Blenhim's bootsale was scheduled for Bank Holiday Monday and I wanted to do a boot. The Belgium GP was on too, that was Lee gone for the afternoon whilst doing all the ironing of course - what a good hubby... OU study in the eve led to brain overload and an episode of Vampire Diaries before bed.